My new favorite show is Unbreakable Kimmy Schmidt. It premiered on Netflix last weekend, and it is sooooo good. It's like Parks and Rec because it's so happy, but the concept is so insane and strange. But I love it. One of my favorite scenes is where Kimmy says you can make it through the next ten seconds, and then just start counting to ten again. I think this sentiment is so amazing because everyone says take it one day at a time, but sometimes you can only take it ten seconds at a time. Focus on the first ten seconds then the next ten and then the next ten. 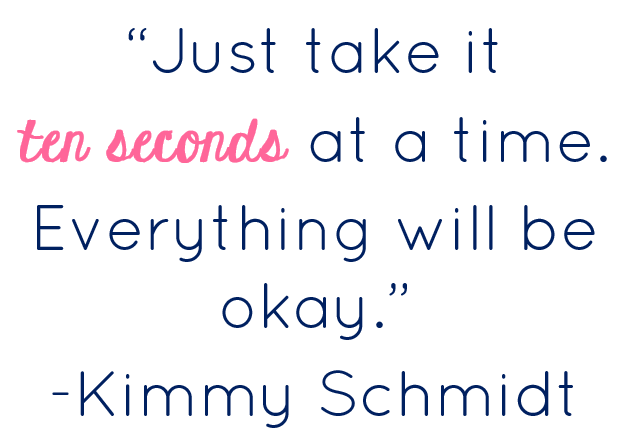 Like Kimmy in the bunker, everything will turn out to be okay.